Talk: Saturday September 28. Gather to share 10am, program 11am to noon. Free to PTArts members and students in the class. All welcome, donations appreciated. This will be a powerpoint presentation that looks at the Navajo history of wedge weave and its current renaissance by contemporary weavers. Wedge weave is an eccentric weaving technique where the wefts are woven at an angle to the warp. 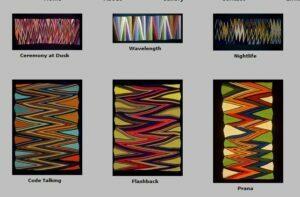 Learn its unique characteristics, basic techniques, and design possibilities to create dynamic and graphic tapestries. Create a sampler or small piece or rug by incorporating various wedge weave techniques and styles and move beyond the expected. 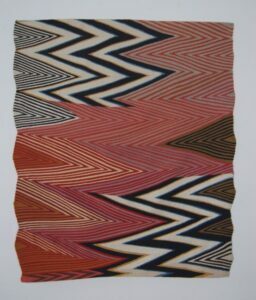 Deborah Corsini has pursued a lifelong passion for weaving. 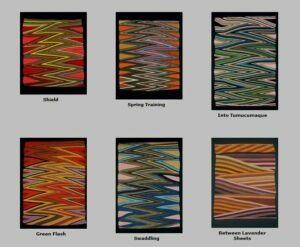 Known for her wedge weave tapestries, her work is exhibited internationally and is included in U.S. Embassies and in private and corporate collections. She teaches an ongoing tapestry class at City College of San Francisco and is an advocate of contemporary fiber art.